Last year, I wrote a checklist in lieu of a list of resolutions. I figured checking stuff off everyday would be easier than resolving, failing, resolving again, etc. Since there’s no time like the present (and I already read more Game of Thrones than I can handle over the holidays), I dove right in with food access and agriculture by watching five episodes of Food Forward by PBS yesterday. There are some cheesy moments, but the series is generally interesting, smart, accessible and surprising. I didn’t know, for example, that seed libraries are actually a thing. You can borrow seeds at the beginning of a season, and then donate new seeds back once you harvest your garden or farm. It’s a great way to preserve local agricultural biodiversity. 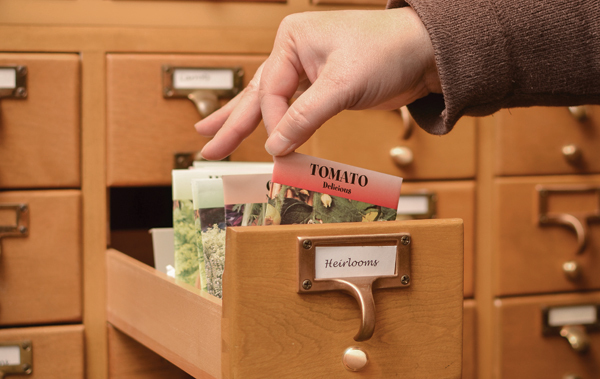 Photo of a seed library by Mike Teegarden and borrowed from this article. In the name of New Year aspirations, I like the idea of feeding the planet (or at least myself) off my patio, so the show + my checklist also inspired me to sign up for a local gardening class that will teach me how to grow edible stuff in pots. The class doesn’t meet until March, so I have a couple of months to learn more new things first (and a check-point in case I start lagging). Here’s hoping the thirst for knowledge never dries up. Happy New Year to you, and happy checklist-making!